More than a decade ago, Paul Gigot of the WSJ pointed out that "ethanol is produced by mixing corn with our tax dollars." In that case, solar energy is produced by mixing sunlight with our tax dollars. If government didn't fund them how would uneconomic projects ever get done? "If government didn't fund them how would uneconomic projects ever get done?" If politicos through the mechanism of government didn’t use taxpayer dollars for political constituency building exercises, how would politicos ever get reelected? If the government didn't fund these uneconomic projects, what would I complain about? Point goes to W.E. Heasley. Plenty of uneconomic projects find private funding. Why, I have invested in a couple of people's start ups that eventually went bust myself. Maybe you meant to say that on net, government funds losers and privately funded projects are winners on net. And, of course, the bigger the loser, the more funding it gets from Uncle Sam. The private sector doesn't do that. Police brutality, dumb laws, war.. Remember: Subsidized solar power is bad, but subsidized and mandated ethanol is good. Maybe there is a silver lining. With the country broke, coupled with potential problems in more taxing and more borrowing MAYBE we will reach a tipping point when both sides have to say enough is enough. I realize it is a low probability scenario but it nice to think about. Yeah, Solar is a dumb idea. and there ain't no telling what sunlight will cost. Gee! I wonder just how much green is at work on this federally funded 'let me buy your vote' site? 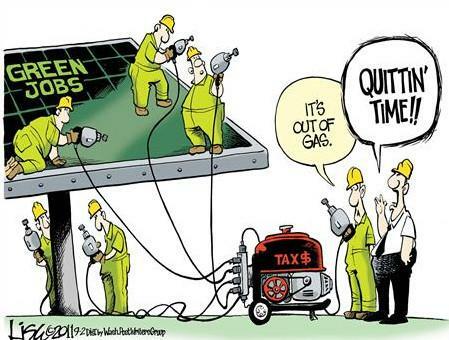 I don't really care whether government supports oil or green alternatives. But if we are going to alternatives, why are we using corn to ethanol route? This only raises the cost of corn, which is a staple food supply for much of the world. Why not use our heads? Take a leaf from Brazil, which converts sugar beets to enthanol. It would seem that if the U.S. switched from corn to any source for sugar we could drive up the price of sugar to unreasonable levels. 1) Sugar source to ethanol. Air benefits. 2) Put a big dent in our overweight/fat problem. Human health benefits.